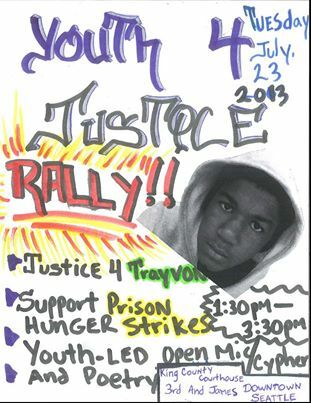 Here is a video of the Youth for Justice rally that high school students in Seattle organized last week, in the wake of the acquittal of George Zimmerman for the murder of Trayvon Martin. This video shows some great spoken word poetry and hip hop; in several of their poems, students spoke about the school system and how it needs to change. Unfortunately the video only covers the beginning of the rally, not the end where students lead an un-permited march through the streets and a blockade of a major downtown intersection. They defied several police dispersal orders and engaged a crowd of onlookers coming out of their jobs and out of the mall. There were no arrests, probably because the police realized that to arrest such a defiant group of people, they’d have to mace them – and it would look really bad to mace a bunch of youth of color in front of a crowd of onlookers with cameras, especially in the midst of all the anger about Trayvon Martin’s murder. This rally was unique because it was youth led and it was militant. It wasn’t simply a matter of adults organizing and facilitating it, then prioritizing youth voices. It was a matter of youth organizing and facilitating it, and deciding which adults they would allow to speak during the open mic. Often when there are defiant actions like this, some activists will claim that those who disobey police orders are putting youth of color at risk. Noone said that this time around, because the action, from beginning to end, was clearly lead by youth of color themselves. Several of my friends were remarking how the youth were better organized than many adult organizations, and they were able to invite the crowd to participate without letting adults take over or talk down to them. Teachers: how can we teach in ways that support this kind of student self-organization, instead of thwarting or coopting it? I am out of town right now visiting family, but I will share my insights on this question when I get the chance. In the meantime, if anyone has thoughts, please feel free to share them in the comments. Categories Class, Event, Mass Incarceration, Race, Self-Activity, Student Organizing, Teaching Suggestions / Pedagogy, What's happening in Seattle? The Youth for Justice rally today was amazing! 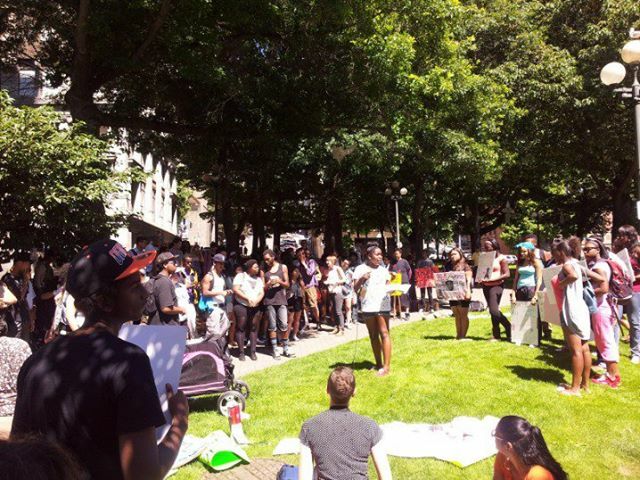 Over 100 high school students in Seattle came together in response to the murder of Trayvon Martin. They also expressed solidarity with the ongoing prison hunger strike, and demanded an end to ICE Holds. (ICE holds are when the King County jail holds prisoners to be deported; inside their chambers, the County Council was debating whether to drop this policy, while we rallied outside). The students were better organized than many adult activists, and they spit some powerful poetry expressing a sharp analysis of the system we live in, including the education system. Their solidarity and care for each other was moving, especially since it crossed racial lines. The mainstream media coverage doesn’t really do it justice – if the youth share their experiences, poems, speeches, or videos of the rally, I’ll post them here. I am a public school teacher. And there are some politicians out there who think that my role should be to stand up in front of you and list a bunch of facts about history. They want me to make you write these down so you can regurgitate them back on a standardized test. If I don’t do that, they will try to get me fired. What those people don’t understand is that truth is not in a textbook or a test, it is out here in the streets. Truth is here in your poetry and your courage and your unity. It is here in the fact that you are not simply learning history, you are making it. So I am not going to stand up here and lecture you. In fact, you are the teachers, and I am and the student. Because what I’ve learned from you today is that solidarity is alive. It is not just an idea or a slogan, it is here in your words and your actions. In the California prisons, the Black and Latino gangs have declared a truce so they can strike against the prison guards who deny them an education and torture them in solitary confinement. You have taken that spirit of solidarity from the prison yards into your neighborhoods, your classrooms, and here into this park. I see non-Black youth here supporting Black youth who are being targeted by the George Zimmermans of the world. And I see non-immigrant youth here supporting immigrant youth who are being targeted by La Migra, and the ICE holds that the politicians up there enforce. This is the kind of solidarity we need to tear down white supremacy and to replace it with freedom. You’re giving me hope that we can build that kind of solidarity between students and teachers. We all know that Black youth are 3 times as likely to be expelled from Seattle public schools as white students. If you all decide you want to fight that, some of us teachers will get your back. We all know that they are cutting funding for education and youth programs, while they’re spending 210 million on a new juvenile detention center to lock ya’ll up. If you want to fight that, we will get your back. We all know they are trying to deport immigrant youth who they label gang members, and we know that they put that label on you simply because of who you kick it with at school. If you want to fight that, we will get your back. Teachers across the country are fed up with this system. Seattle teachers successfully boycotted the MAP test this spring and defended a teacher at the Center School when he was transferred for teaching anti-racist curriculum. So if they try to get us fired for teaching about the Black Panthers or the Chicano movement, will you get our backs? If we demand smaller class sizes and enough time to build caring relationships in the classroom, will you get our backs? This, right here, is where the real learning happens, not on some scantron bubble test. We make the road by walking it. We write the story by living it. And together, we can tear down all the borders and prison walls that divide us. Categories Event, Mass Incarceration, Organizing Strategies, Race, Self-Activity, Solidarity Statements, Standardized Testing, Student Organizing, Teacher organizing, What's happening in Seattle? I recently joined the Badass Teachers Association. The BAT Facebook forum exploded rapidly over the past few weeks, drawing together thousands of teachers who want to fight back against the corporate education “reformers”. These politicians and think tanks, who should be called “deformers”, are setting us up to fail by imposing new centralized standards while at the same time cutting crucial resources we need to teach. I’m happy to see that teachers are tired of this, and that we are starting to organize ourselves to fight back. I’m happy to see we’re done playing the role of passive, obedient professionals, and instead we’re ready to act like badass workers. This puts us in good company: it puts us on the side of badass truckers, longshore, warehouse, and fast food workers who have been fighting back recently. White supremacy can only be broken down through action. When a mostly white jury found George Zimmerman not guilty for the murder of Black teenager Trayvon Martin, thousands of people took to the streets. Imagine what it would be like if workers built off of this energy by shutting down business as usual, saying “if you are going to kill our youth, we will refuse to work”. This is how the West Coast prisoners have responded to injustice; why can’t we do the same? Of course, a strike action would take serious coordination and organization, and I hope that networks like the Badass Teachers Association can start laying the groundwork for that within our schools. However, judging from the Facebook debates, not all of the Badass Teachers are on the same page about the need for this kind of solidarity. Some suggested that talking about race, rather than racism itself, is the source of the divisions among us. The whole discussion about Trayvon had started because some teachers were posting heartfelt questions about how they could help their students process these traumatic and racially charged current events in the classroom. Others were emphasizing that many of their students could be the next Trayvon if we don’t take action to challenge the racism that lead to his murder. However, in response to these genuine expressions of solidarity, other teachers argued that talking about Trayvon or about the underlying racial issues is a distraction from fighting the corporate education reforms. Some people on here are asking why issues of race are relevant to badass teachers. Here’s one answer. Teachers are under attack by corporate education deformers like Gates, Broad, the privatizers, etc. One of their main strategies is to rally working class communities, including working class Black communities, against teachers. They do this by pointing out how the public schools reproduce class and race inequality in society – what they call the “achievement gap”. The thing is, our schools DO reproduce inequality and everyone knows it. The corporate “reformers” have no effective solution to that problem – they will simply scapegoat us for it, in order to deflect popular anger away from them. But they will succeed at doing that if we remain complacent in the face of all the inequality in our schools. So if teachers want to defeat the corporate attacks on us and our schools, then we can’t simply defend public education as it currently exists . We need to fight to transform it. We need to directly confront institutionalized racism and white supremacy, in our schools and in the larger society. Joining our students in making sure they don’t become the next Trayvon Martins is part of that. That’s one more reason why I’ll be out there on Tuesday joining with students who are rallying to make sure they are not the next Trayvon. If we are going to be badass teachers, we need to act like badass fighters against all forms of oppression, including the white supremacy that is devouring the lives of our students and communities. This week people have taken to the streets in mass protests across the country, furious that George Zimmerman was acquitted after killing Trayvon Martin, a Black teenager in Florida. High school students in Seattle are moving this struggle forward by organizing their own rally on Tuesday, the 23rd, at 1:30 in front of the King County Courthouse. They are pointing out that Trayvon’s death is part of a racist system, the same system that denies them a meaningful education. By taking action they are learning through practice, and making history instead of just taking tests about it. They are also teaching the rest of us that this generation is tired of being imprisoned, miseducated, and gunned down. Like the prison hunger strikers, they are showing it is possible to come together across racial, communal, and neighborhood lines. We the youth are deciding to come together in solidarity to protest on the behalf of trayvon martin and against the other injustices of the system. We the youth of color are profiled by police, we are more likely to get arrested and go to jail then finish high school, and our families are scared for our safety. We are tired of every obstacle that stands in our way. We are looked down on as the minority but together we are the majority. We are asking for other youth and adults to come together in solidarity to help protest with us. Not just for trayvon martin but for other youth that may have lost their lives. All races, ages, and neighborhoods are welcome to come!! 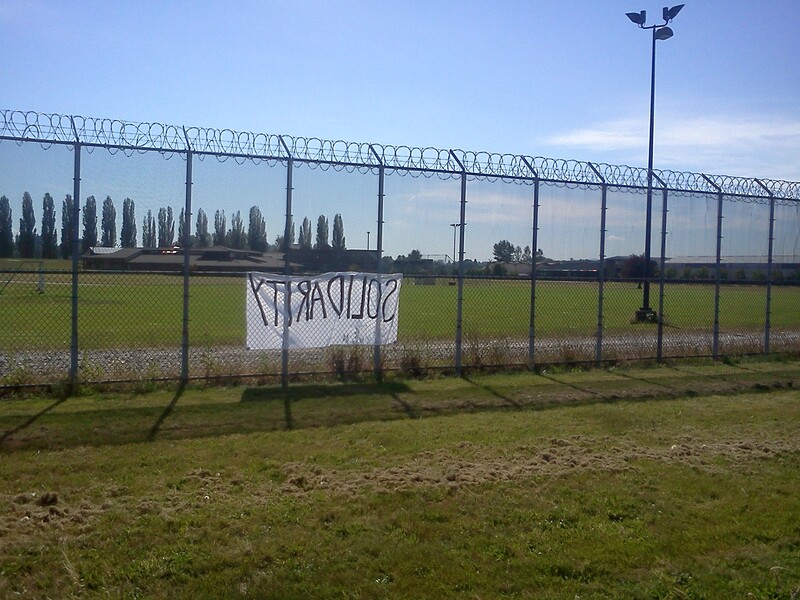 We were inspired by the strike at the California and the Green hill prisons and we participated in the rally at the King County prison. It is significant that students are making connections between the West Coast prison hunger strikes and the struggle against racist vigilantes like Zimmerman, seeing both the prison system and violence by individual vigilantes as obstacles to their growth. I have been surprised that more people are not making these connections. One of the students involved in organizing this rally also did her own hunger strike last week, in solidarity with the striking prisoners. Youth in my community are devastated about the many injustices of our system. people think that just because we are young we have no say or even care about what goes on in our justice system, we are labeled as a minority but together we are the majority. I believe that if we come together and make our voices heard we will make a bigger statement of how serious we really are. Treyvon Martin, john t Williams these are not the only injustices. if you want to stand up for human rights don’t be afraid to fight. There is going to be a cypher session and poetry will be read. This page is for youth to organize, adults we would like for you to stand with us because this is not over we demand justice. come support us justice for everyone. Please spread the word, and if you can, please print out the flyer above and pass it out. Thanks! Categories Event, Mass Incarceration, Race, Self-Activity, Student Organizing, Student writings, What's happening in Seattle? I received this letter from a high school student who attended this week’s rally in solidarity with the California and Green Hill prison strikes. She told me she shared it with King 5 News but they never responded to her. I am posting it here with her permission, to make the public aware of her courageous action and her insightful critiques of the school and prison systems. Please share this widely. My name is Alondra Garcia. I’m 16 years old, from Evergreen High School (AAA). I wanted to share that I’ve been on hunger strike since Thursday morning, July 11th, in solidarity with the prisoners who are on hunger strike in California prisons and in the Green Hill Youth prison here in Washington State. I had also fasted on Monday the 8th and Tues the 9th for the same reasons. I decided to restart my hunger strike on the 11th for religious reasons. I want to say that I believe that everyone should get an education; as long as we don’t get it out here in our population, it causes people to go through the wrong things and get into bad situations. The bad situations cause them to get imprisoned, and when they are imprisoned most of the prisoners want to change but don’t get the chance to change because we are not supporting them. When we, the people, don’t give them any chances, then they have a great chance of going back due to the fact that we are constantly telling them they don’t belong with the outside population and we’re telling them they have no opportunities to work with most jobs. The “prisoners” are treated as lesser than the rest of us, and it’s not right to judge someone who had to do what he had to do to survive. If people and the system really want there not to be so much violence, they need to stop putting them down and support them on their way to change, and give them the proper education they didn’t get and they now want to learn. Please hear me out when I say that the public schools only teach us how to be a worker, but in private schools they get taught how to be the boss. There is so much injustice in the justice system and the schools that we, the students, go to. If they want us to graduate then the school system should at least try to help improve, but instead they just talk and talk but never help as much. They don’t clarify what we need to do and don’t actually give us an explanation of why we need to learn it. They give us tests on subjects we didn’t learn about. To make it worse, they base their decisions of how many jails to build on those test scores. The system is manipulating the youths’ thinking and decreasing their mentality so that they think they are never going far. We are the future, and the prisoners got a right to get treated better. They should have a chance to change and become a better person. Categories Class, Commentary, Mass Incarceration, Self-Activity, Solidarity Statements, Standardized Testing, Student Organizing, Student writings, What's happening in Seattle?